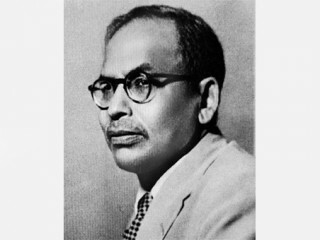 Meghnad Saha (October 6, 1893 – February 16, 1956) was an Indian astrophysicist best known for his development of the Saha equation, used to describe chemical and physical conditions in stars. In 1905, when the British Government divided Bengal into East and West, the people were outraged. No one more than a 12-year-old schoolboy, Meghnad Saha. He was too young to join the band of revolutionaries formed to fight for Bengal’s unity. So he had to find some other way of protest. His opportunity came when it was announced that the British Governor of Bengal was to visit his school. Despite the stern warning that everyone should be present to greet the governor, he and some of his friends boycotted school on the day the Governor arrived. The next day, the names of Saha and his friends were struck off the rolls of the school. Saha had to play a heavier price than the rest as he lost the scholarship he had won only a few months earlier. This spirit of nationalism and self-sacrifice was evident right through his life, even when he became a well known scientist. The patriot in him made him a nation-builder too. He not only tried to raise the status of science in independent India, but also served the cause of the poor. Saha was born in Shaoratoli, Daka district, now in Bangladesh, on October 6, 1893. His father was a petty grocer who barely managed to keep his large family from starvation. He wanted his fifth child, Meghnad, to start earning for the family from childhood. But on the advice of local teachers, who found him a brilliant student, the grocer allowed the boy to join a boarding school eleven kilometers from the village with a well-wisher playing his fees and other charges. When Saha secured a scholarship, he was sent to Daka for higher studies. After the boycott, he had to join another school. However, in the final examinations he stood first. Again winning a scholarship he joined Presidency Collage, Calcutta. Here he was only taught by eminent teachers like J. C. Bose and P. C. Ray but had brilliant contemporaries like S. N. Bose and P. C. Mahalanobis, who, like him, became noted scientists in due course. Saha secured the second position in M.Sc. (the first position went to S. N. Bose) and decided to join the Indian Finance Service as he wanted to help his needy family. Fortunately for scientific research in the country, his earlier school boycott and association with nationalists like Subhash Chandra Bose and Rajendra Prasad stood in his way and he was not allowed to take up any government job. Naturally, he turned to his first love-research in physics and mathematics. He earned his living by giving tuition, cycling to distant places, morning and evening, to teach his students physics and mathematics. In 1917, he and S. N. Bose were appointed lecturers at the newly opened University Collage of Science in Calcutta. Thermodynamics, relativity and atomic theories were then the latest developments in physics and Saha read books on these subjects avidly and taught them as well. It was while preparing his lecture notes that he came across an astrophysical problem, the solution of which made him world famous. Astrophysics deals with the nature of the stars, their temperature, internal structure and composition. Reading Agnes Clark’s books on the sun and the stars, Saha found the problem that intrigued him. Just as sunlight passing through suspended rain drops produces the rainbow, a band of colors, called “spectrum”, is produced when sunlight passes through a glass prism. With the band of colors are dark and bright lines of varying thickness in the spectrum, called “spectral lines”. Gustave Robert Kirchoff had shown that these spectral lines told the elemental composition of the sun, but astronomers could not make out what caused them. Aware of the latest advances in physics, Saha put forward an “ionization formula” which explained the presence of the spectral lines. The formula also enabled an astronomer to know the temperature, pressure and other aspects of the interior of the sun or any other star. The formula proved to be a breakthrough in astrophysics. Saha was hardly 25 then. The scientific world applauded his work. One eminent astronomer even called it the twelfth major discovery in astrophysics. In 1927, almost a decade after his discovery, Saha was elected Fellow of the Royal Society. Till then not many of his countrymen had known him or his work. And some scientists had even gone to the extent of calling his formula a fake and made efforts to stop him from joining the physics department of Allahabad University. Saha was, however, an eigenschaften, an invincible person, a name he had acquired because of his tenacity of purpose. He did not care what others said of him and went on doing his research and teaching. In Allahabad he began research in spectroscopy, the study of the spectrum and ionosphere, and thus raised the department to international status. Ancient Indian history, geology and archaeology also attracted his attention. He studies the origin of the Saka era and measured the age of some rocks. Later, when he moved to Calcutta, he did research in radio waves from the sun and radioactivity. When Otto Hahn, the father of the atom bomb, discovered “fission” in 1940, Saha immediately recognized its importance. On his initiative nuclear physics was taught for the first time in the country at Calcutta University. In 1948 he founded what is today known as the Saha Institute of Nuclear Physics in Calcutta. Having seen cyclotrons used for research in nuclear physics abroad, he ordered one to be installed in the institute. In 1950, India had its first cyclotron in operation. Saha was also a social worker. Having suffered poverty himself, he did not forget his poor countrymen. When the partition of India took place and refugees from East Bengal (now Bangladesh) poured into the country, he did much to resettle them. He also did not forget the relief work he had done in his childhood when the river near his house used to overflow its banks during the monsoon. He studied the origin and control of floods and suggested a number of river valley projects. The Damodar Valley, Bhakra-Nangal and Hirakud projects are the final products of the work that he started. Saha was fearless and frank in his criticism of some governmental policies. He had full faith in industrialization and was against the “back to the village movement”, which, he claimed, would not solve the problems of poverty, disease and ignorance. He founded a magazine, Science & Culture, to put forward his views. In 1952 he stood as an independent candidate for Parliament and was elected by a wide margin. He died on February 16, 1956.